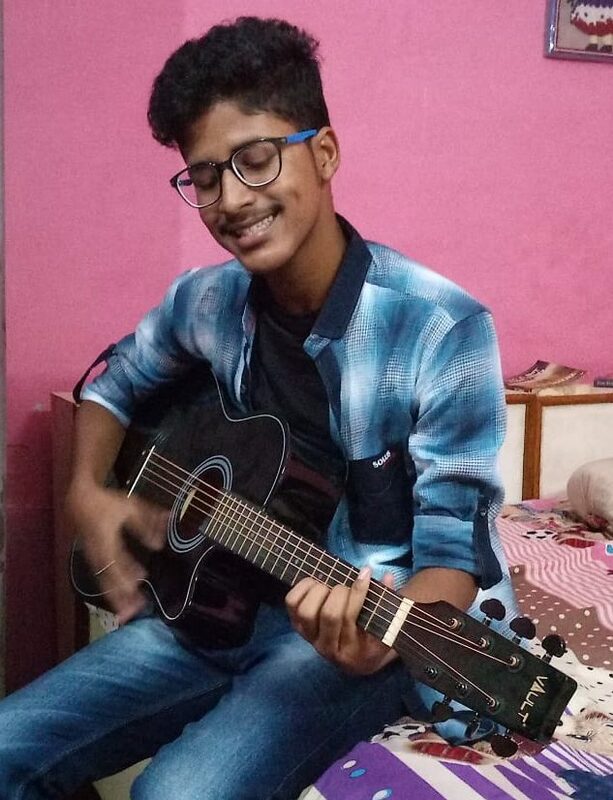 This story of Mr. Somidh Roy, a resident of a small town called Nainpur in Mandla district of Madhya Pradesh in Central India, is nothing short of inspiration for aspiring singers everywhere. Do you remember the last time you made a new year resolution? Oh yes, we were all there at least once, aren’t we! Making a resolution is the easy part, but following up on them time and again to see it bear fruit is the actual grind – which only few among us pull off. Now add non-conducive environment to this mix, and it is fairly easy to see how hard it soon becomes to achieve what we have set out to do. Somidh belongs to a service class family. His father works in Indian Railways and mother is a house maker. He is currently pursuing commerce. His early inspiration to learn singing comes from his uncle who never learned music formally, but used to perform at family get togethers, orchestras and a few events. He helped Somidh correcting his mistakes during the early days. Perhaps he also partly draws this inspiration from his mother, who has learned a few basics of singing during her childhood and helps him as well at times. But this apart, much like many sleepy towns of India, Somidh did not find much around to draw inspiration from and nurture himself. There is an undercurrent of apathy towards music education in general. Somidh being a self-motivated person who actively sought out for help, he looked for help online. He has filled the missing gaps of his learning by watching videos on youtube. And then one day, he chanced upon Riyaz that solved his major problem with finding quality content along with guidance on correcting himself. Ever since, he wakes up everyday at 5 AM and practices for 1.5 hours with Riyaz. Though he troubles his father too early in the morning, he says that he can sense the progress he is making towards singing better. He also practices for one hour in the evening from 4 PM to 5 PM. Somidh finds it very useful that he can practice wherever he is with Riyaz and doesn’t have to alter that schedule. Today, he gathered enough confidence that he sings at his family gatherings. Here is a short video of a song which he sang on our request. Team riyaz is very proud of having made a significant contribution to enriching his life and contributing positively towards singing better. His dream is to be a playback singer one day. And with an iron will that he has, we are sure nothing can really stand in his way! Let’s wish Somidh the best for his brilliant future! Credits: This article is an excerpt of an interaction of Swapnil Gupta and Ayushi Gupta with Mr. Somidh Roy on his singing journey.